Frozen margaritas are quite possibly the most wonderful drink to enjoy poolside. The refreshing cocktail paired with the cool water and hot sun are the perfect combination for relaxation. 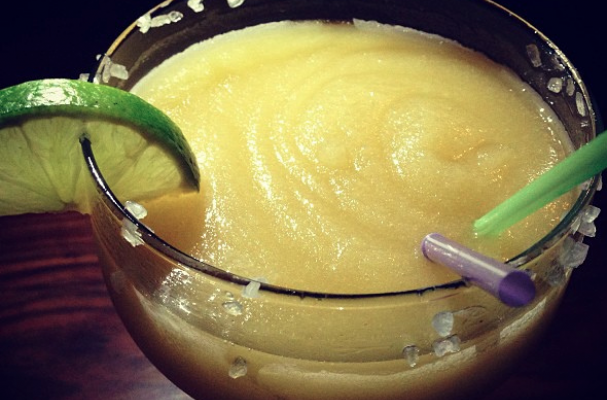 I cannot control the weather or your access to a pool, but I can help you craft the perfect frozen lime margarita. Frozen margaritas don't have to taste like cheap tequila mixed with sickening sweet lemon lime mix that culminates in a slushy machine. They can be SO MUCH better than that. Just like with cooking, the perfect cocktail begins with stellar ingredients. For the tequila, purchase a brand that boosts being made from 100% agave. This quality indicator means that all the tequila in the bottle is a direct result of the fermentation of the agave and only the agave which yields a better tasting spirit. The same goes for cocktail mixes. You are better off using fresh lime juice and simple syrup. You can taste the difference and the flavor is far superior. Prior to making frozen margaritas, chill the mixture in the freezer before blending. This step will help the cocktail stay cooler for a longer period of time. Also, use crushed ice instead of whole ice cubes to help the cocktail come together faster. Combine all the ingredients in a sealable container and chill the mixture in the freezer for six hours or overnight. Prepare the margarita in two batches. Place half the tequila mixture and half the ice in a blender and blend until smooth. Serve in chilled salt rimmed margarita glasses.